Continuing with our commitment to bring the arts to Los Banos, we offer a variety of classes for our community to attend, enjoy and learn from. We offer a variety of ceramics classes that are suitable for all levels of clay experience. Our ceramics classes are typically 6 week sessions, 2 hours long, 1 day per week. Whether you are just beginning, experienced or advanced you will learn the techniques involved in ceramics. You can choose your own project and our instructor will guide and teach you along the way. Tuition typically covers: the class, 6 week session, clay & supplies. Membership can be purchased at time of sign up for any of our classes and is an annual membership. If you’re interested in attending one of these classes you can contact us here, you can also see our upcoming classes here. We are a local Quilting Guild and we are connecting quilters and quilt lovers to other quilters and quilt lovers. This is a great place for individuals of all skill sets from beginner to experienced. You will learn Quilting techniques and become part of a community of other fellow quilters that will support you with your projects. For more information on our Quilting, see our Quilting Group page here, you can also see our upcoming classes here. If you’re interested in attending a specific class to Quilting, contact us here. Learn the techniques of painting by your Wet Canvas Instructor Kelly. Kelly will give you step-by-step instructions and provide you with all the painting supplies you will need to paint your masterpiece. This class is full of fun and joy for you and to especially enjoy with a friend or 2. Included with your ticket price: All painting supplies, your masterpiece and sometimes a drink & snacks! For more information on attending one of our Wet Canvas classes contact us here, you can also see our upcoming classes here. If you would like to reach Kelly, here is her facebook page @SegmentedArt. Have you ever wanted to make your own scarf? This is the perfect class for you! Your instructor Dani will teach you exactly how to make a silk & wool scarf. All you need to bring is 1 bath towel, 1 plastic bag & a pod. Everything else will be supplied for you. For more information on attending our Felting Classes contact us here, you can also see our upcoming classes here. This is one of our newest classes that we have just included here at the Arts Council. 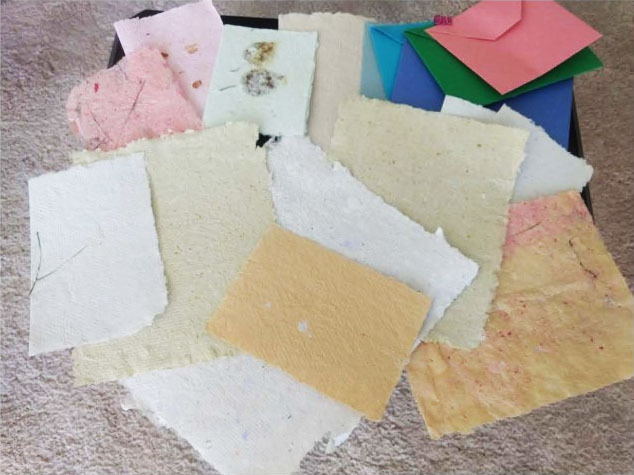 This is a workshop where you will enjoy making your own paper in different sizes, structures and colors, even envelopes! All you will need is: 2-3 large towels, paper (white or printed), pressed flowers, leaves and/or ferns. If you are interested in attending this new class contact us here, you can also see our upcoming classes here.